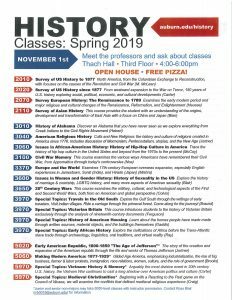 Unconventional Honors Seminars will be offered from Spring 2019 with the intention that these will be offered every semester (inclusive of Summer). These seminars are all 3 credit hours each and they count as academic courses in the Honors curriculum. Seminars are repeatable (6 credit hours maximum). They do not count towards the Senior Year Experience. This seminar is meant for students who would have had at least one semester-long internship that was paid or unpaid. The focus of the seminar will be on the personal journey to embark on and partake in an internship and unpacking the impact of the internship on the student’s future. Same as for HONR 3007 004 except that the internship was completed outside of the United State of America. Students that have completed at least one semester of co-op or practicum in their area of study. In this course, students will delve into connections between theory and the real world and, most importantly, the key lessons learned in career readiness from the experience. Diversity and inclusion of other cultures and the growth that comes from such is what this seminar attempts to uncover. Students will delve into how their views, beliefs, values, and cultural competencies were challenged and/or cemented based on the study abroad experience. This course provides a platform for students that have been actively involved in community service for a number of semesters to aggregate the impact of that community service work. Students will explore the impact of their work on the service agency as well as the impact of the service on them. This course allows students the opportunity to focus on unique projects–such as starting a new campus organization, designing a new service project, or launching an entrepreneurial endeavor—as part of their student experience. This new version of the Apogee Project will be offered Spring 2019. The Apogee Project is 3 credit hours and counts as an academic course in the Honors curriculum. This course does count towards the Senior Year Experience and students will work one-on-one with the course instructor to fulfill course requirements. In this course, students will create an ePortfolio while examining how their Honors College body of work has shaped their time at Auburn University. 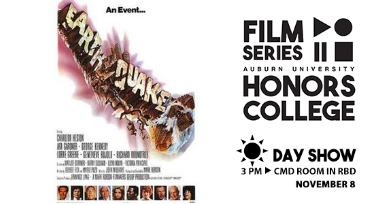 This course is intended for students near the end of their Auburn University and Honors College experiences. In this course, students will create their Honors ePortfolio as their capstone or culminating experience. 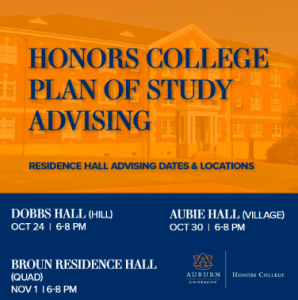 Here students will dissect every Honors College course and experience that they had during their time in the Auburn University Honors College and hopefully find some connective threads. Students will then explain what they got out of their Honors College membership and experiences in a final ePortfolio. 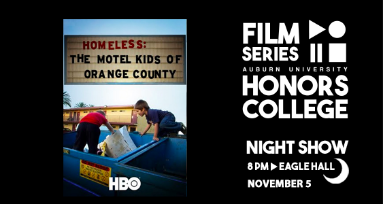 In short, this course forces the student to explain how their Honors College body of work has shaped their time at Auburn University as future outlook. 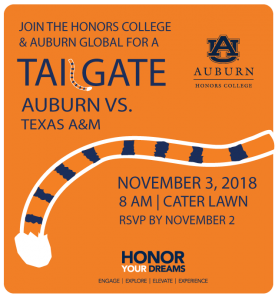 Join the Honors College and Auburn Global for a tailgate on Cater Lawn prior to the Auburn / Texas A&M game on November 3rd. Festivities begin at 8 am and end prior to kick-off. This is a come-and-go event, however, we ask that you please rsvp in order to get an accurate headcount. RSVP by November 2nd. The Southern Regional Honors Council is now accepting proposals for a presentation, performance, or poster for their upcoming conference. This year’s conference will be held in Memphis, TN, from Thursday March 28 to Saturday March 30, 2019. Proposals are due by 11:59PM on Saturday, December 1st, 2018 and will be reviewed in early January. Acceptances will be announced at that time via email to the student and college Honors Director/coordinator. For full details on the 2019 SRHC Conference and proposal categories, please visit: http://www.srhconline.org/conference/. This semester the Honors Introduction to Art History class is working with Dr. Floyd and the Jules Collins Smith Museum to research, curate, and present a small exhibition of portraits and self-portraits from the museum’s permanent collection. The show, which the students have titled “Dignity and Diversity: Portraits from the Permanent Collection,” is on view at the Jules Collins Smith Museum through December. The students will present the pieces on various nights throughout the month of November and all are encouraged to attend. The students will be presenting the pieces at various nights throughout the month of November and all are encouraged to attend. The informal gallery talks will be on Thursday, November 1 at 5 pm, Thursday, November 8 at 5 pm, and Friday, November 9 at noon. These talks will culminate on November 29 at 6 pm when the final presentations are given followed by a reception at the museum. The museum wants to celebrate the work of the student-curators and encourage everyone to see the exhibit in person. 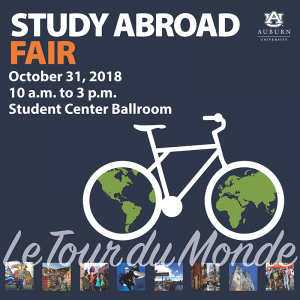 Auburn Abroad will be hosting a Study Abroad Fair on October 31 from 10 am – 3 pm in the Student Center Ballroom. Come to hear more about the trips that the Honors College will be taking this year! The first PPAC meeting for Auburn University applicants planning to apply to dental, medical or optometry school programs in 2019 for enrollment in 2020 is scheduled for Tuesday, November 6, 2018, in the Sciences Center Auditorium, beginning at 6:00 p.m. Auburn University PPAC members provide guidance about the application process as well as a committee letter from Auburn University. From 6:00-7:00 p.m., Ms. Krysta Diehl will give a presentation about writing a compelling personal statement, one of the first tasks for applicants. From 7:00-8:00 p.m., Ms. Beverley Childress will discuss PPAC policies for the next application cycle. Attendees will receive a list of applicant responsibilities including items due in January 2019 to begin working with the committee. The Foundation for a Better Economy is inviting college seniors to write a thesis on the economy for a chance to win a $500 scholarship. Scholars will have the opportunity for a paid internship for the summer of 2019 with the foundation. This internship tasks will include researching and synthesizing economic and policy data, assisting in social media management and content creation, and helping in day-to-day operations. This is a great way to gain nonprofit and startup experience, make contacts for the future, learn research and economic analysis skills, and improve technology and social media skills. 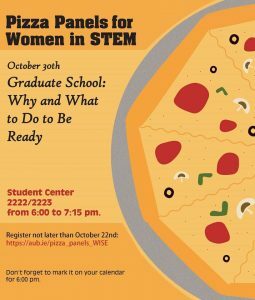 Come network with peers in STEM fields while you eat pizza and learn about opportunities to maximize your time at Auburn! 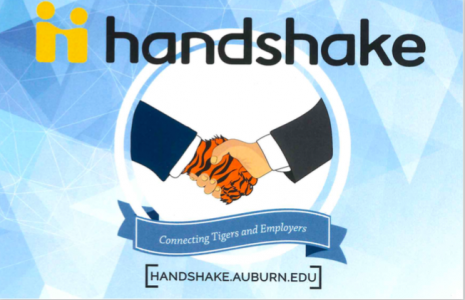 Handshake currently has over 4,000 employers and over 7,000 for current Auburn students. 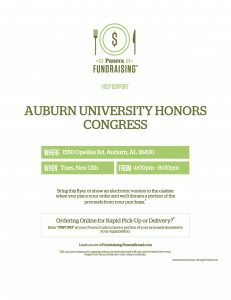 Go to handshake.auburn.edu for more information on opportunities. 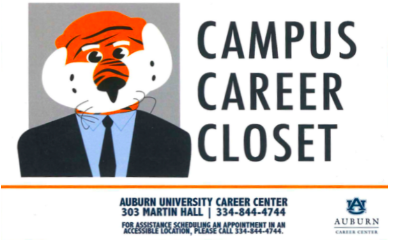 The Auburn University Career Center has a campus closet where students can rent business casual and business professional items for interviews. Students can take up to four items at a time. 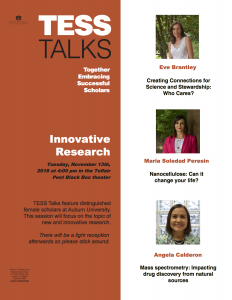 On Tuesday November 13, students have the opportunity to hear women faculty talk about their research with a TED Talk style presentation, followed by a reception. This Research Fair is open to all Auburn University students, faculty and staff!